Fish and Tofu with Tausi. A couple of weeks back I was in Manila for my leave, I was looking for a place to have a quick lunch at a mall. The fish and tofu with tausi meal at the menu sign board of Chowking caught my attention, every now and then a new dish or rather an old dish that was remove and being re-introduced by this fastfood restaurant then and now. Being on a low fats diet this dish was appropriatefor me and not to mention it is one of my favourite fish dish, Despite knowing that the quality of Chowking’s food is not that great I have no choice, they are the only fastfood restaurant that is serving this dish so I ordered the meal for myself. Well true enough if it was not really great, it taste bland it lacks the true taste of the ingredients. Maybe because of economic reasons, they have to sell something that most people can afford or they want to make more money they made short cuts on the quality. Ok enough on that it is best to cook the dish yourself. I used tilapia fillet for these recipe. If you don’t have time to prepare a fillet. Use any white fish fillet available at supermarket. Dust fish cube with salt an pepper let stand for 5 to 10 minutes to marinate, put flour in a bowl and dip each fish to coat with the flour. In a skillet deep fry fish in batches for 5 to 8 minutes or until golden brown, keep aside. In same skillet deep fry tofu for 5 to 10 minutes until golden brown, keep aside. In a wok sauté garlic and onion, add in tausi and stir cook for 1 to 2 minutes. Add in 2 cups 1 to 1 1/2 cups of water and simmer for 2 to 3 minutes. Now add in the vegetables, sugar, hoisin and oyster sauce, cook for 1 to 2 minutes. Thickened sauce with cornstarch diluted in 1/2 cup of water. 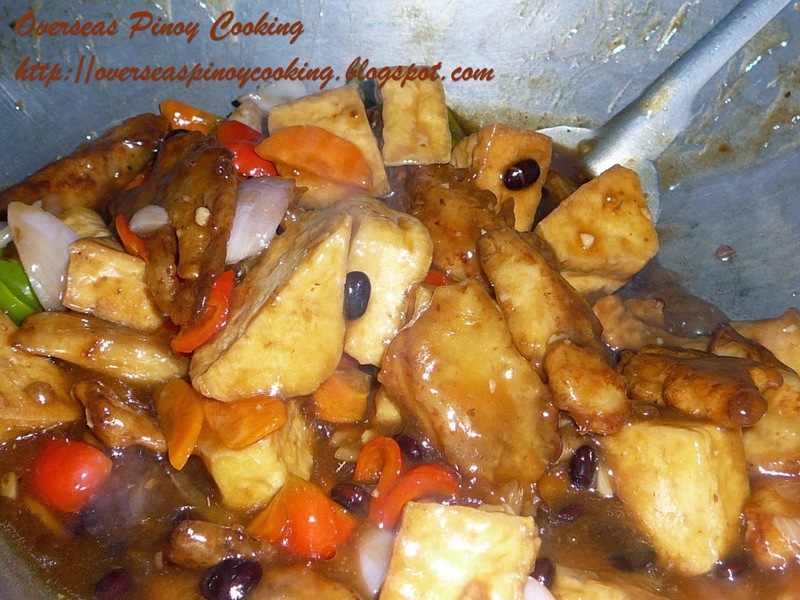 Add in fish and tofu and stir cook for another 2 to 3 minutes until the sauce is infused to the fish and tofu. Season with salt and pepper to taste. yum yum yum ... now will I ever attempt this at home? i order this from Chowking. hehe. tipidmeals, yes this dish is one of their best seller. gosh, i've been looking for this recipe! i first tasted this meal at a restaurant abroad with a thai cook. will definitely try this at home. thanks. honestly this is my fave dish in the said fastfood but the taste and servings differ from one food chain to another i wonder why!so i'm very glad to come across your recipe i can't wait to try this at home! i usually try different recipes for variety and to avoid monotony! tnx a lot! looking forward to other exciting fish recipes! by the way fish is my fave that's why! Thanks for the recipe! I should try this one, looks easy to make. Just a question, did you actually used 1/4 cup cornstarch diluted w/ 1/2 cup water to thicken the sauce. Your recipe above used 2 cups of water & simmered? Please enlighten my curiosity on this...I do appreciate your answer. Thanks for sharing your recipes! Yes I used those quantities of water, Please note that the recipe uses 1 kilo of fish and 4 cakes of tokwa, add more cornstarch should you want a thicker sauce consistency. what is hoisin sauce? any alternative for this? I am curious what is this houisin sauce? any alternative sauce that can be use if this is not available..
For this recipe just mash 2 tbsp. of tausi, 1/2 tsp. sugar and a dash of Chinese five spice. But if you've found tausi (fermented black bean) and Chinese five spice in your supermarket then hoisin sauce should also be available. anong klaseng fish po kaya ang magandang gamiting para sa dish na to? Tilapia fillet ang ginamit ko sa recipe na ito, but any firm white fish fillet will do, try cream dorry fillet. Just adjust the quantity of water, some of the readers find the quantity too much. Napansin ko rin, from the photos of those who tried the recipe. Good luck. i have zero knowledge in cooking and now here in saudi, i like to try this. what happened to the sugar? just curious. Thanks for pointing out, add the sugar together with the hoisin and oyster sauce. I already rectified the error. Goodluck on your cooking. Thanks for the recipe. paborito kung orderin sa Super bowl,at manhann, pero mas masarap sa Manhann.I will try this at home. thanks! Hi tibogs, thanks for dropping a line I hope it will turn out great, good luck. I've searched this today kasi mag luluto ako nito para kasing nakaka miss yung sa chowking na ganito. Thanks for this post.